In the digital era, new media has become an integral part of life. The development of new media in art has been so tremendous that it has given birth to a unique language for visual arts, giving artists new areas to explore in their creative process. To promote new media art and to celebrate the 21st anniversary of the Hong Kong Visual Arts Centre, the Art Promotion Office (APO) under the Leisure and Cultural Services Department has teamed up with renowned local new media artist Hung Keung to conduct a creative and experimental workshop and exhibition, enabling the younger generation to experience for themselves the elegance of Chinese calligraphy in the digital world. Through exploring the beauty and wonder of Chinese characters and the characters’ relationship with national identity, participants have been able to gain new insight into traditional Chinese culture blended with multimedia art. Entitled “Interactive Jam with Digital Art Pro”, the exhibition will be held from this Saturday (August 3) until October 31 at the Hong Kong Visual Arts Centre. Hung Keung is an assistant professor at the School of Design, Hong Kong Polytechnic University. He has been actively involved in local and overseas exhibitions as well as research. His works have ranged from painting, film and video to interactive art. In 2005, he founded innov + media lab (imhk lab) to explore possibilities relating to the disciplines of new media, visual art, technology and design. Hung has received a number of awards, including the Award for Outstanding Young Artist (Film and Media Arts) in the Hong Kong Arts Development Awards (2007); an Achievement Award in the Hong Kong Contemporary Art Biennial Awards (2009); the Award for Best Artist (Media Arts) in the Hong Kong Arts Development Awards (2010); the Best Short Ambient Video Award at the BBC British Film Festival; Best of EMAF at the European Media Art Festival in Germany; an Honorable Mention (new media) at the 7th International Festival of New Film; the Special Mention Interactive CDROM Award at e-phos, the 3rd International Festival of Film and New Media on Art in Athens, Greece; the Gold Award and Special Jury Award at the Hong Kong Independent Short Film and Video Awards; and the Best of Code Award at the Microwave International New Media Arts Festival. In the workshops conducted earlier by the APO, a group of young people and other members of the community came together through different channels like talks, a school culture day and open recruitment on Facebook. They took part in the workshops to create their own calligraphy works using traditional rice paper and brushes. The diverse works by different participants have been digitised and will be featured on a giant screen in the exhibition as a means to engage visitors to take part in the exhibit. To tie in with the exhibition, the APO will hold a sharing session, during which Hung will discuss with participants the concept of his work and the development of new media art. Participants of the workshops will also be present to share their thoughts and experience gained during the workshops. Participants in the sharing session will also have a chance to interact with the new media artwork. The sharing session, to be conducted in Cantonese, will be held from 2.30pm to 4pm at the Hong Kong Visual Arts Centre on August 3. The activity is free of charge and a quota of 70 for walk-in entry will be available on a first-come, first-served basis. 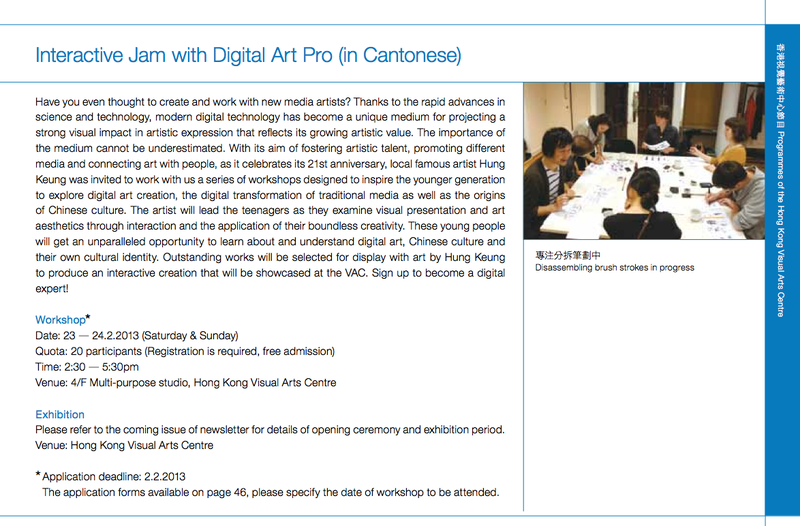 For details of the “Interactive Jam with Digital Art Pro” exhibition and its sharing session, please call the APO at 2521 3008 or visit the website:www.lcsd.gov.hk/CE/Museum/APO/en_US/web/apo/va_digital_art_pro.html. The Hong Kong Visual Arts Centre is located at 7A Kennedy Road, Central. It is open daily from 10am to 9pm and is closed on Tuesdays. Admission to the exhibition is free.